Mass. employers depend on their graduates and say more must be done to address long wait lists and out-of-date facilities. His training at Madison Park led to a dream job in a city garage for Reno Guerrero. “Madison Park saved my life,” he says. On a Monday morning in late spring, city buses arrive like clockwork on Malcolm X Boulevard, disgorging students hunched over cellphones, earbud wires trailing down the fronts of hoodies. They file toward Madison Park Technical Vocational High School, where executive director Kevin McCaskill, in a suit and pin-striped shirt with matching pocket square, and two other administrators greet them as if part of a receiving line. “Good morning! Good morning! Good morning!” McCaskill booms at bleary-eyed kids moving as if they are battling a stiff wind. Guerrero is a success story, but his school, one of the most beleaguered in the state, fits a different stereotype: the vocational school as a place where “you stuck people who had nothing going for them,” says Katherine S. Newman, a social scientist at UMass Amherst. In 2014, Madison Park had a four-year graduation rate of 63 percent (the statewide average is 86), and on the 2015 math MCAS, only 24 percent of its students scored at least proficient (the statewide average is 79). Almost 60 percent of its students are economically disadvantaged, nearly triple the statewide rate, and it has almost double the rate of students with disabilities of the Boston Public Schools overall. Madison Park’s widely known designation as one of the state’s underperforming schools has obscured what’s happening across the rest of the Commonwealth: rising interest in vocational schooling. Students want into vocational schools for the job opportunities. The Commonwealth’s 55 vocational schools claim some 48,000 students, but more than 3,000 others are wait listed at schools without seats to accommodate them. Massachusetts vocational schools are stretched thin at a time when local employers anticipate the majority of jobs they’ll create in the next few years will be well suited to vocational school grads. Business owners and others fear not enough is being done to address the problem. “We’re turning away work because we don’t have the people to do it,” says Michael Tamasi, CEO of Avon-based AccuRounds Inc. His company, which makes precision-machined parts for industries, including medicine and aerospace, recruits heavily from the voc-ed schools in southeastern Massachusetts and Greater New Bedford. “Employers are clamoring for training,” says Barry Bluestone, a professor of public policy at Northeastern University, who has co-authored two recent studies on vocational education in Massachusetts. The October 2015 report, “Meeting the Commonwealth’s Workforce Needs,” analyzed 675 occupations, from journalist to bank teller, and found state employers anticipate having 1.2 million relevant job openings between 2012 and 2022. In the January 2016 report, “The Critical Importance of Vocational Education in the Commonwealth,” 90 percent of employers surveyed wanted a larger pool of vocational-school graduates and nearly the same percentage agreed the schools themselves should have more modern equipment. Of respondents, 75 percent said they prefer to hire voc-ed graduates for entry-level positions and 61 percent for higher-level jobs. Despite that interest, vocational schools have a long history of disfavor to overcome. Bluestone says public opinion about them started to trend negative after the 1963 federal Vocational Education Act required the schools to educate all comers, including prisoners and adults who needed retraining. With US manufacturing becoming a smaller part of the economy and automation replacing workers, a perception emerged that these were schools of last resort. Unlike many industrialized countries, the United States “pushed the blue-collar training agenda into an educational corner and virtually assured that anyone who ventured there would be tarred by stigma,” UMass’s Newman and coauthor Hella Winston argue in their new book, Reskilling America: Learning to Labor in the Twenty-First Century. This national notion that vocational education tracked students toward dead-end, non-white-collar professions also took root in Massachusetts. Former lieutenant governor Tim Murray, an ardent advocate of vocational ed who is now president and CEO of the Worcester Regional Chamber of Commerce, says that while the 1993 Massachusetts Education Reform Act pumped more than $80 billion into schools to enhance academic standards, accountability, and school choice, it eliminated the position of associate commissioner of vocational technical education. After that, voc-tech programs “were treated as second-class citizens, because [state education overseers] were just so focused on MCAS,” Murray says about the standardized test that has been a high school graduation requirement since 1993. In fact, many of the state’s vocational schools, or “vokes,” as they’re called, now see higher MCAS pass rates than the state’s comprehensive schools, have average dropout rates of below 1 percent, and send 57 percent of their students to post-secondary schools. Vokes offer the same core academic courses as comprehensive schools and many even offer Advanced Placement courses, along with vocational training. Brendan O’Rourke, a lanky 18-year-old from Arlington with a shock of dark hair, shows me around Minuteman Regional Vocational Technical High School in Lexington one day last spring. “My parents thought voke schools were for knuckleheads,” he confides as we walk through the underground “trade floor” where students in football field-size rooms bend over car engines, measure and cut PVC pipe, blast sheet metal with blowtorches, and fashion electrical circuits on pegboard walls. O’Rourke explains that his middle school wood-shop teacher saw him struggling in English and math and suggested Minuteman as an alternative to Arlington High School. O’Rourke and his parents drove the 3 miles to the school, nestled on 66 wooded acres in Lexington just off Interstate 95, and after touring it, decided he should apply. He was admitted on the strength of his grades, attendance record, discipline history, recommendations, and an interview. Minuteman’s 87 percent graduation rate, like that of many Massachusetts vocational schools, is better than the state average for the nearly 950,000 students in the public schools. This is so even though almost half the students come into the school with an Individualized Education Program for a range of educational challenges such as autism spectrum disorders; intellectual, developmental, visual, or hearing impairments; and anxiety or depression. 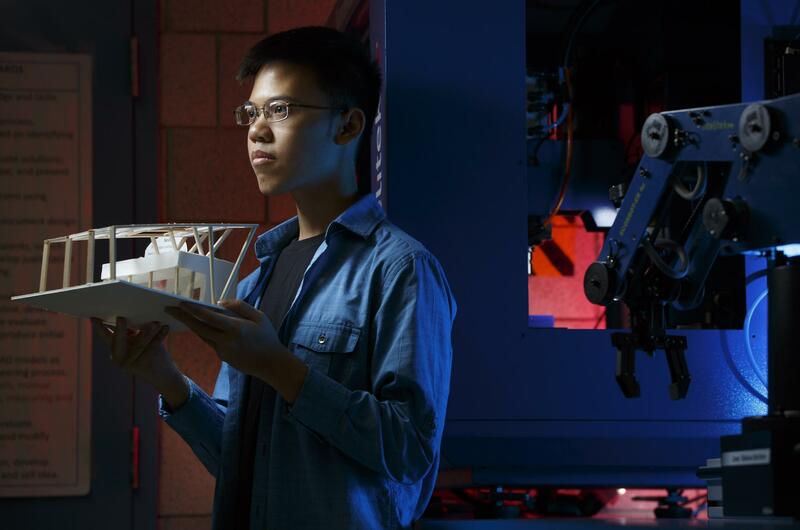 The data suggest vocational education’s mix of academic classwork with hands-on training helps these kids excel, and parents are noticing — one reason for the wait lists at many schools. Wearing white lab coats, hair tucked under protective caps, seven of O’Rourke’s classmates sit at a long table, pipettes in hand. Small class sizes are not unusual in vokes; as one administrator puts it, teacher-student ratios need to be smaller in classrooms where kids are wielding blowtorches or wiring transformers. O’Rourke and his classmates in the biotech track have to create an unadulterated bacteria culture in a petri dish. O’Rourke would go on to achieve his goal; he graduated in May and now is a biology major at the University of Massachusetts Lowell. When Tim Murray was a Boy Scout growing up in Worcester, he recalls earning part of a merit badge by visiting Worcester Vocational High School. Built in 1909, the school was funded by local industrialists intent on turning the influx of Irish, French, and Swedish immigrants into a trained workforce. Today, Worcester’s immigrants come from Iraq, Burma, Bhutan, Burundi, Somalia, Liberia, and Vietnam. Like other “gateway cities” — New Bedford, Springfield, Brockton, Fall River — with high unemployment and large minority communities, skill building is in demand. Worcester Technical, which replaced the old voke in 2006, has some 1,400 students. There were 500 students wait listed for the class of 2019. Murray is a driving force behind the Alliance for Vocational Technical Education coalition, which brings together the Massachusetts Association of Vocational Administrators, chambers of commerce around the state, and the Massachusetts Competitive Partnership, a public policy group of CEOs that aims to promote job growth. One of AVTE’s primary goals is to get thousands of students off wait lists and into the metal shops and industrial kitchens. To do so requires “a new level of thinking,” Murray says. “It’s about better utilizing the dollars right now that are allocated in the education world and in the workforce training world. It’s about more flexibility of funding. It’s thinking in some new ways about after-school and summer programs to get these skills for those kids on waiting lists. David J. Ferreira, executive director of the Massachusetts Association of Vocational Administrators, says that “ideally, we would build another two or three schools” to get at least some of the kids off waiting lists. But, statewide, the overall number of high school students is stagnant, and in areas such as Western Massachusetts and Cape Cod, enrollment is actually dropping. “When the existing buildings aren’t full, it’s hard to make a case to build new schools,” Ferreira says. With the biggest waiting lists generally in gateway cities that can’t share the tax load with wealthy towns like Lexington or Dover, “the state’s got to pick up a bigger piece of the action,” he says, never an easy proposition. Like Murray, Ferreira believes that regional vocational school staff offering after-hours programs for local high school students could be part of the solution. For instance, at Greater Lowell Technical High School in Tyngsborough, the state’s largest voke with 2,250 students, superintendent-director Roger Bourgeois says the school has turned away a hundred qualified students each year since 2013. At the same time, the school has completed a $65 million renovation, adding a new cafeteria, a cyber cafe, and 13 new science labs. Grant money is available to schools for innovative proposals, and Bourgeois pictures offering four of Greater Lowell’s 24 vocational programs (one each from the personal service, construction, technology, and manufacturing/transportation clusters) as a half-day session. Wait-listed students would attend academic classes in their local high schools in Dracut, Dunstable, Lowell, and Tyngsborough from late morning through mid-afternoon, then get bused to Greater Lowell for shop classes. But vocational students also come out of high school with a real skill. They could, as Murray puts it, “earn and learn” their way through college. “They’re generally more serious students, and they’re work-ready,” he says. Like other voke schools, Madison Park is enormous, more than a million square feet of 1970s Brutalist-style concrete architecture. After the morning rush on that day back in May, Madison Park’s wide halls seemed eerily quiet. 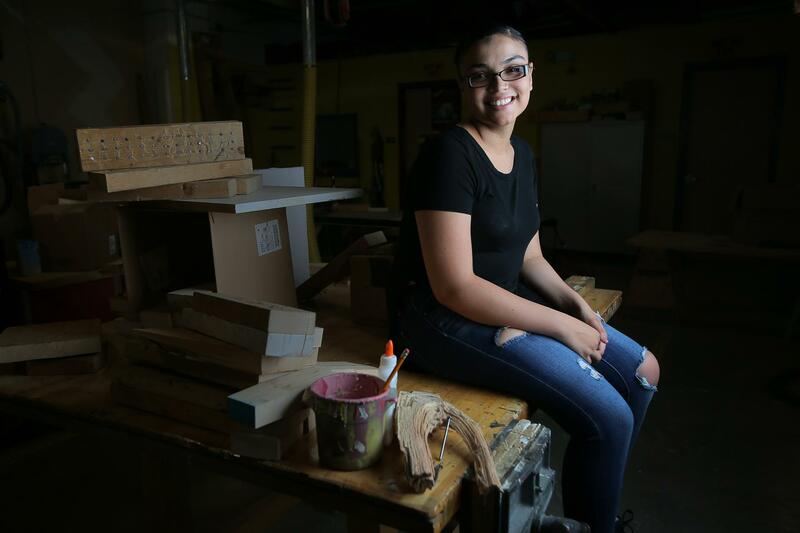 But in a room smelling of raw lumber, senior Kayla Colon, thick black ponytail falling to her waist over a Roxbury Community College T-shirt, maneuvered a plank through a table saw. At a break, she showed off a meticulously crafted toy chest with a hinged top, a present for her then 4-month-old daughter. Colon spent three years in the facilities-management program at Madison Park. She knew as soon as she tried out the program — which encompasses carpentry, electricity, plumbing, painting, papering, and landscaping — that it was right for her. “I like to work with my hands,” she said. After studying facilities management at Madison Park, Kayla Colon, who says, “I like to work with my hands,” will start college next spring. Colon graduated from the program this year. She considered joining the carpenters’ union but plans instead to study criminal justice at Roxbury Community College, which is close to her home in the South End and has a day-care center for her child. Colon’s classmate at Madison Park, Reno Guerrero, who graduated with her, is now taking classes at MassBay. 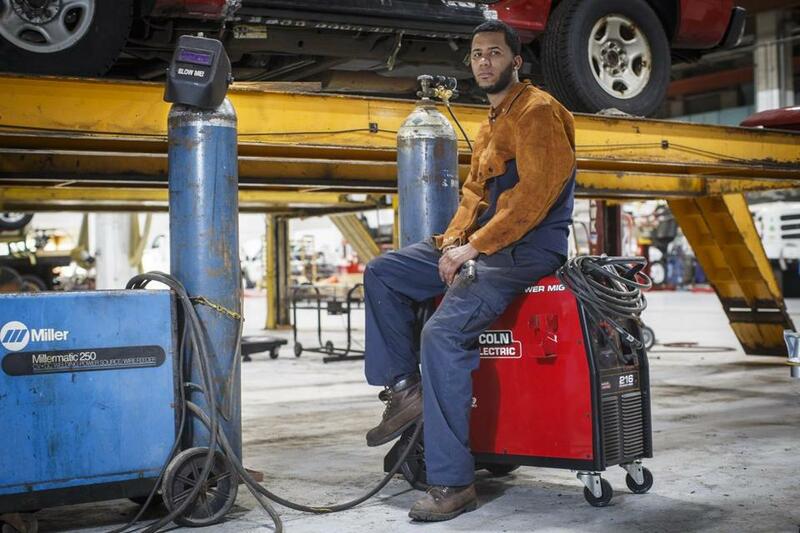 His Madison Park teachers had assured him that with the skills he learned in high school — and the city garage job that will cover his college tuition — he’s likely set for life. He hopes they’re right. His older sister has married and moved out of their Dorchester home. It’s all on him and his brother, he says, to “return all that happiness” that his mother has provided the family in the challenging years since they emigrated. He sees other teens doing drugs and joining gangs, but he doesn’t want that for himself. “I love cars,” he says simply. “This is my passion. I have to do what I love to do, and if I want to do this in the future, even if it’s not easy at first, I have to study hard and work hard.” He hopes, now that he is earning a salary, his mom will be able to quit her job as a taxi driver. You can also view this article on the Boston Globe’s website here.